Are you making a list for spring cleaning? The septic system is frequently forgotten when planning seasonal home maintenance projects. You know the list: clean gutters, replace air filter, have HVAC checked, clean chimney, check the roof, etc. A properly and timely maintained septic system can last for as long as 30 years. Performing regular septic tank services can save you money over time compared to a neglected system that needs field line repair or replacement. 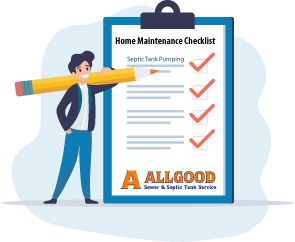 So, if you are not on a regular schedule, make sure to add septic tank pumping to the home maintenance checklist now. The septic tank does require regular maintenance. Every 3 years the septic system should be pumped out. If you also have a pump tank that should be serviced every 1-2 years depending on household water usage. Now is a great time to start your regular maintenance. 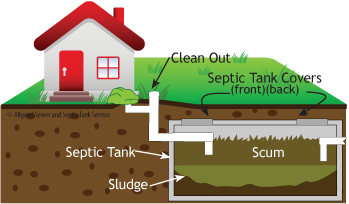 Average septic system, read more about how a septic tank works. Septic system with a pump and junction box is common and works basically the same. Enzyme treatments are important for your septic system but do NOT take the place of having your septic tank pumped out. Some brands can be misleading with their advertisements that you never need to pump your tank. Read all their information and you’ll find it is a part of septic maintenance not a replacement for pumping. If you have questions about enzyme treatments, aka septic tank additives, we have another article about how septic enzyme treatments work. Save money – the biggest advantage of regular maintenance is saving thousands of dollars. A well maintained septic system lasts longer. If you keep ignoring your septic tank, you can ruin your field lines and will need repairs or all new lines. Sewage back up – if septic tank pumping hasn’t been done in the last 3 years it is time to get it inspected and pumped. The more solid waste accumulates in the septic tank, the higher the chances of sewage back up in the house. Bubbling toilet – if your commode burps, bubbles or you hear other strange new sounds, this is telling you that septic system service is needed right away. Slow drains – a full septic tank can also cause drains to go slow. All the water from the pipes will start draining slowly and unclogging remedies don’t work. This means your septic tank needs attention right away. Protect ground water – if your septic tank isn’t working properly, it can contaminate ground water. It also increases the chances of health issues for your family due to contaminated water. Maintaining your septic tank on a regular schedule is easier than dealing with backups that create an emergency situation where you cannot use your plumbing at all. For over a decade middle Tennessee residents have relied on Allgood Sewer and Septic Tank Service to pump their septic systems and keep them on a regular maintenance plan with their free Reminder Program. Contact Allgood today and put your home a scheduled maintenance plan. Enjoy the season and don’t forget to add septic tank pumping to the Home Maintenance checklist.